Travertine tile is made of natural stone and is desired for its rustic appeal; a popular choice for both indoors and outdoors. Travertine flooring adds an unmatched sense of style to any home. In a variety of finishes from brushed travertine, tumbled travertine and polished travertine, these tiles have been the stone of choice for over a millennium and continues to be popular today. Honed travertine tile, sometimes referred to as a matte finish, is characterized by the filling in of the holes and pockets that make travertine so recognizable. The face is soft to the touch but does not shine as a polished finish would. Polished travertine tile is smoothed down and sanded with diamond pads, resulting in a polished, vibrantly colored finish. To learn more about polished travertine tile, click here. Brushed travertine tile gets its texture by being finished with a steel brush that smoothes out the sharp parts of the stone, yet still leaves the travertine with a natural, textured matte finish. To learn more about brushed travertine tile, click here. 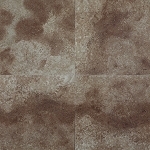 Tumbled travertine tile is placed in a large drum with many small rocks and chunks of cement, where it is then tumbled until it is finished, resulting in tile with worn and visibly chipped faces and edges and muted colors. 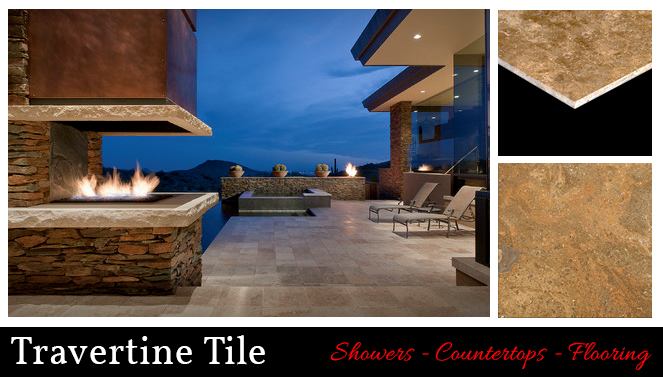 To learn more about tumbled travertine tile, click here. Travertine tile is quite versatile and can be used both indoors and outdoors. 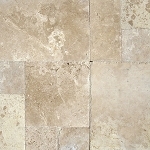 Interiorly, travertine tile is a popular choice in the kitchen, bathroom and throughout the house or business. When properly sealed, Travertine will last you a lifetime and will slowly patina over time giving you a gorgeous, aged look. Travertine tile is able to make the transition from inside to outside, and is a preferred choice for pool areas. Travertine tile is made from a porous stone, meaning it will absorb the water outside of your pool, resulting in a less slippery area. Travertine pavers are an ideal choice for any garden; they add rustic charm and elegance to any yard or terrace area.